Buon Compleanno to one of the greatest Milan legends of all time. Franco turns 47 today and it's only right that the Number 6 shirt gets paid some respect by all rossoneri fans. He has been the heart of sole for Milan for many years, and his passion for the club still remains as we see him in the coaching department! GRANDE FRANCO, SEMPRE IL NUMERO 6! 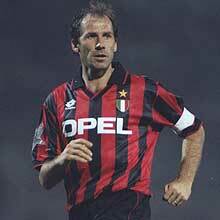 Franco Baresi (born May 8, 1960 in Travagliato, province of Brescia) is an Italian youth team coach and former football defender with A.C. Milan, acknowledged as one of the greatest defenders ever to play the game. Baresi was colloquially called "piscinin". Baresi led the AC Milan team and its defense for the best part of a decade; a period during which Milan's defense was considered by many observers to be one of the best back four in history consisting of Paolo Maldini, Alessandro Costacurta and Mauro Tassotti. He is also one of the few players who spent his entire career at one club, AC Milan, for whom he played 532 games, scoring 16 goals. He retired from playing in 1997 aged 37. With Milan, Baresi won six scudetti (Serie A league titles) and three European Cups. He mentored defensive partner Paolo Maldini in his later years, whose career has followed a similar path. His #6 jersey was retired by the club, a rarity for Italian football. After a short spell as Director of Football at Fulham, Baresi returned to Milan as a youth team coach in 2002. Baresi played in two World Cups for Italy. Baresi was part of the 1982 World Cup squad in Spain aged 22 as sustitute of another great defender, Gaetano Scirea, but didn't play. His international debut came later that year in a match against Romania. He also missed the 1986 tournament and made his World Cup debut in 1990 when Italy were the hosts. The Azzurri lost to Argentina in the semi-finals, but went on to beat England in the third place play off. In the 1994 World Cup he was one step closer to lifting the trophy, losing to Brazil in the final. Despite missing four matches after being injured in Italy's group match against Norway, he underwent emergency surgery and returned to captain the team in the final. He missed the first penalty in the shootout after the 0-0 full-time and extra-time score. He was also a member of the Italian squad that finished fourth at the 1984 Summer Olympics in Los Angeles, California. Bow to the great former captain of Milan and the Azzurri. I was too young to watch him play for the most part. But I did catch him in World Cup 94 and I can never forget his tears after Italy lost to Brazil. sigh..
yeah I too was too young, and vaguely remember the 1994 WC, but i have seen clips. He is a legend, and will forever be remembered.